Holidays like Thanksgiving, Black Friday, Cyber Monday, Christmas and New Year present a great opportunity to capture visitors looking for deals, since holiday sales are worth more than $84 billion in the US alone. In this case study, we’ll learn how Podcast Insights is using onsite retargeting and seasonal optins to convert abandoning visitors. Podcast Insights is focused on well-researched audio equipment reviews and detailed guides to help people start podcasting. Ross Kaplan-Winn from Podcast Insights joined us to talk about how he uses OptinMonster. “I wanted to grow my email list quickly.” Ross said. That goal is not uncommon for OptinMonster customers, but Ross’s goal was even more strategic than that. He wanted to build a targeted email list, adding subscribers to segments within his list which were specific to the content the reader was most interested in. And, he wanted to do it without adding multiple lightbox optins to every article. Ross was able to accomplish both goals using MonsterLinks and Exit-Intent optins. Let’s take a look at both to see how he did it. One of the most popular pages at PodcastInsights.com is this Podcast Starter Kit article. It offers readers the information about the equipment needed to get started podcasting. Ross created a downloadable guide with the same information presented in the article, only the guide sorts the options by budget. That’s very helpful for a new podcaster who might feel overwhelmed at the many options for equipment and the cost differences between brands. Ross used MonsterLinks to present the offer within the content of the article. 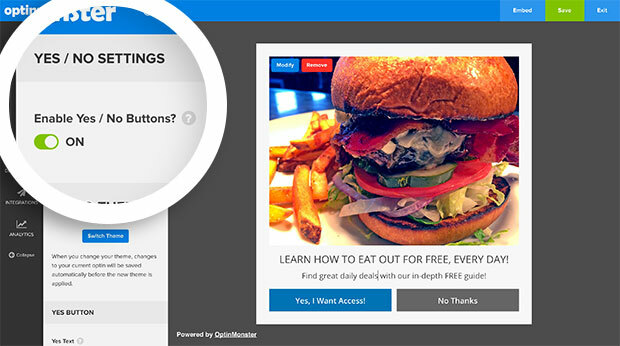 MonsterLinks turn any image, button or link into a 2-step optin campaign. When a visitor clicks on the MonsterLink, a popup appears showing an optin. MonsterLinks work because when people initiate an action (like by clicking a button), they’re more likely to finish it. But what if someone reads the article without clicking one of these calls-to-action? Ross left nothing to chance, launching the same lightbox optin as the reader attempts to leave the website. He did this using our Exit-Intent Technology. It monitors your visitor’s every action on your site, displaying your targeted campaign at the exact moment they’re about to leave for good. Ross launched the same optin with two different triggers by utilizing multiple Rulesets within the optin’s Display Rules. Using multiple rulesets allow you to target different readers with the same offer, without having to create seperate optins for every unique trigger. Ruleset A can activate a MonsterLink for an optin, while Ruleset B can trigger the same optin on Exit. Before using OptinMonster, less than 1% of readers opted in to the Podcast Starter Kit lead magnet. Now, this optin converts 9.63% of readers. Ross also uses an exit-intent popup on every page of the site. He configured the optin NOT to display on the pages above. The offers on those pages are specific to the content and should naturally convert better than a more general, site-wide offer. Currently, the site-wide optin directs readers to a list of Black Friday deals. 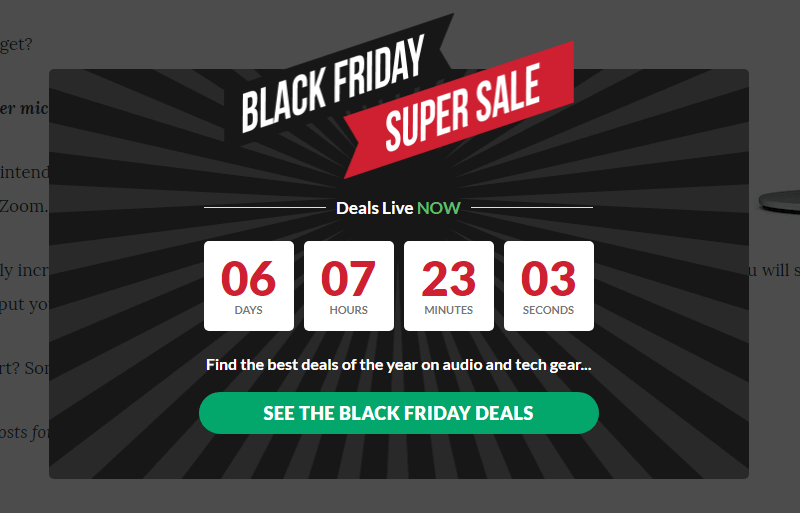 Nearly 4% of readers who were about to leave the site entirely choose to stay and visit the Black Friday deals instead. Ross designed this optin using our Black Friday theme and a two-step optin. Our Yes/No feature allows you to turn any optin into a two-step optin, displaying a Yes button, and a No button. Both the Yes and No buttons can open an optin, redirect to another URL or simply close the optin. And, like Ross has done, you can simply toggle off the No button and use the Yes button as a single call-to-action. When the Black Friday/Cyber Monday holiday sale is over, Ross will turn off this offer and reactivate his standard year-round exit-intent offer. Alternatively, he could use our Display Rules to schedule an optin, choosing the dates and times an optin should display. Scheduling marketing campaigns lets you display time-specific offers, deals and coupons, without having to be there to make sure they happen at the right time. Ross gained control of when and where his optins appear using our powerful display rules, and saw conversions increase as a result. Using MonsterLinks and Exit Intent optins, Ross increased downloads of his Podcast Starter Kit 1099%! Using our Black Friday theme in an exit-intent optin, Ross kept 4% of abandoning visitors on his site. Our Display Rules make it easy for you to quickly and efficiently create and target new offers to your readers. Features like MonsterLinks, Exit-Intent, Yes/No buttons, and Scheduling can be used together to increase conversions without annoyiing your readers. OptinMonster is simply the best. I tried several other competitors first, but quickly requested refunds once I tried OptinMonster. Easy of use, speed, tracking, you name it – they blow away everyone else in every category.